New York (AFP) - The National Football League's season-opening clash between the Philadelphia Eagles and Atlanta Falcons saw a sharp dip in ratings, figures showed Friday, as President Donald Trump renewed criticism of the league. 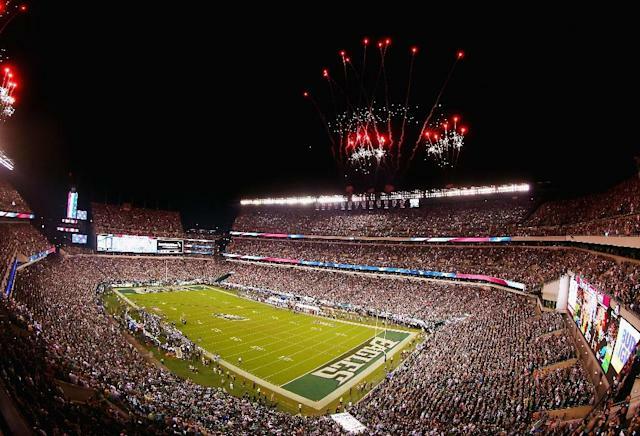 NBC television reported that the weather-delayed game in Philadelphia recorded a rating of 13.4% of households, a steep drop from last year's season-opening figure of 14.6%. Thursday's ratings number is way down on other season kick-off games of recent years, with 16.5% watching in 2016 for the Carolina Panthers-Denver Broncos game and 17.7% tuning in for New England's clash with Pittsburgh in 2015. While the delayed start to Thursday's game is likely to have influence the figure, the sharp dip comes as the NFL struggles to quell controversy over the issues of player protests. The issue was thrust back into the spotlight this week after NFL sponsor Nike revealed that former San Francisco 49ers quarterback Colin Kaepernick, who launched his protests against police brutality and racial injustice in 2016, had been chosen to front a new advertising campaign. The advert featuring Kaepernick, who claims he has been blackballed by NFL team owners over his activism, aired during the third quarter of Thursday's game. President Trump, who has been a relentless critic of players who refuse to stand for the anthem, slammed Nike and the NFL on Friday on social media and in an interview with Fox television. "What was Nike thinking?" Trump wrote on Twitter in a reference to the Kaepernick advert. Trump, who scheduled a campaign rally in Montana on Thursday night to coincide with the NFL opener, later criticized the league in an interview with Fox and Friends. The NFL had in May announced a compromise which required players on the field to stand during the anthem, but allowed athletes to remain in the locker room if they preferred not to stand. That policy was later shelved after protests from players. Several rounds of negotiations between the players union and the NFL have so far failed to settle on a solution. On Thursday, only one Eagles player, Michael Bennett, appeared to protest. Bennett stood for the start of "The Star Spangled Banner" but then sat on the team bench before the song had finished. "I don't know what the NFL is doing," Trump said Friday, condemning the proposed policy of allowing players to remain in the locker room during the anthem. "I think that's worse than kneeling in a certain way," Trump said. "That shows that you just have no respect for the anthem and the flag." "I don't like what Nike did. I don't think it's appropriate what they did. I honor the flag. I honor our national anthem and most of the people in this country feel the same way. They feel the same way." Political analysts have predicted that Trump will seek to keep the anthem issue alive as he attempts to energize his base ahead of crucial mid-term elections in November.